Sudeep D'Souza: How much money does an auto driver make ? 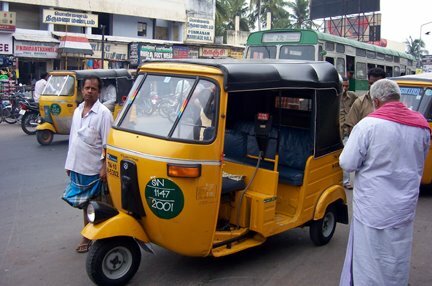 How much money does an auto driver make ? A couple of days ago as it was raining I was not very enthusiastic to drive to work so I decided to go in an auto. The driver of my auto was a pretty chatty kind of a person and I engaged him in a conversation that I was wanting to have with one of them for a long time - how much money does an auto driver make in a day? Apparently an auto driver makes about Rs. 150 a day and if it is a good day he will make Rs. 200 and this is after paying off the rent and the petrol for the auto. So I asked him what is the rent - it is Rs. 120 for a petrol auto and Rs. 200 for an LPG auto. How much does it cost to buy a new auto - About Rs. 150,000 and if it has to be converted to LPG an extra Rs. 20,000. Contrary to popular belief this driver said that the police never bother him as long as he does not break a traffic rule. So it looks like the auto drivers complaining about police being highhanded as one of the reasons for them striking is to just make sure that they can break any rule and the police should not do anything to them - something the city bus drivers enjoy just now. At that price, they should just buy a Maruti 800 and start a Taxi Service. Thats surely another way to look at it and it makes me wonder then why are there so many autos on the road - I guess the answer is the milage they give and thus reducing the running cost of the vehicle.